Let’s celebrate it on Wombania!!! That’s a(nother!) 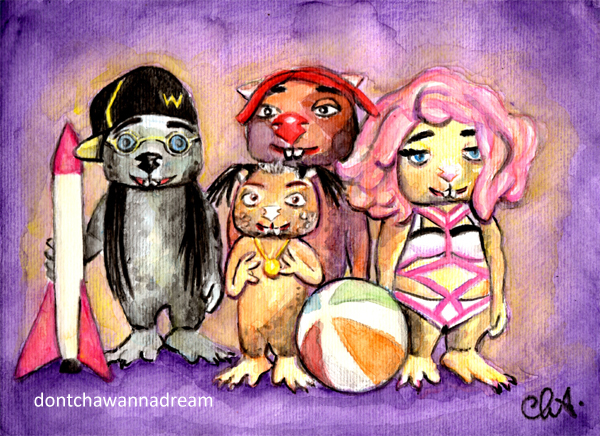 great Wombie painting, Cha! I’ve never envisioned them as gangsta rappers, that’s for sure! Happy Wombat Day! There’s plenty of chocolates (Belgian!) and wine gums and cake and milkshakes and pancakes left! Only the best chocolates for Wombat Day! And the Belgian wombat-shaped truffles are the best of the best. Fraz thinks he’s extra cool now! A mini-Bieber, oh no! Love it…….or should I say THEM! Happy Wombat Day, Cha! The wombies looks great! Uh uh uh… YEAH! (I’m so gangsta). Ahah they are so cool, aren’t they? Ha! Looks great! (I’ll bet the soundtrack sounds pretty good, too)! The soundtrack sounds so cool!!! Ooops..I’m late…but Happy Wombat Day to you too Cha!! Loved the painting!! Happy belated Wombat Day and great job, Cha! I love all the little details and color! Hugs!